This was Dominick's Restaurant on Westchester Avenue near Zerega Avenue, a landmark for many years. It was torn down a few years back and replaced by a Social Security building. This is a classic winter scene taken at the Parkchester Oval around 1984. This was taken at White Plains Road and Wood Road. The building in the background is 1366 White Plains Road, and the two stores were Dave's Candy Store, and Albert's Barber Shop. The photo was probably taken in 1956 or 1957, before the NY Giants moved to San Francisco. I'm probably pretending to give my best "Willie Mays" batting stance, dressed up ready for another baseball season, rooting for my favorite team, the NY Giants. This is a picture of my Grandfather's service station. It was located on Castle Hill Avenue and Parker Street. The man with his hands on his hips is my Grandfather, and the boy directly in front of him is my father. This picture was taken during the 1930s. This picture was taken in front of 1662 Parker Street during the late 1930s, looking out across Castle Hill Avenue with Parkchester in the background. Where those houses are on Castle Hill Avenue is now the school yard for Public School 127. This picture was taken on Easter Sunday, April 1956. It was in the oval in the center of Parkchester. You can see the buildings in the background and the residents enjoying the sunny day. My brother Larry is on the left, my sister Florence in the middle and I'm on the right, showing off our new Easter wear. This is a photo taken in 1962 of President Kennedy's motorcade. In the photo, along with JFK, Mayor Wagner is readily identifiable. Editor's Note: This photo was taken on 161st Street, just west of the Grand Concourse. In the distance on the right are Executive Towers, still under construction. The Bronx County Courthouse would have been behind the photographer. A view of Riverdale and the Palisades from Kappock Street, taken in the 1960s. 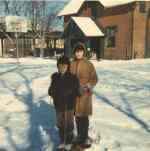 This picture was taken in 1939 on 215th Street between Bronxwood and Paulding Avenues, the street where John Gotti Jr. was born. My Mother delivered most of the Gotti children. This was taken in January, 1968 in the Westchester Bronx YMCA at 2244 Westchester Avenue. That's the elevated #6 line in the background.